The Public Awareness Committee of the Maryland State Bar Association has prepared this information. It is intended to inform the public and not serve as legal advice. You’re driving down the highway, oblivious to the speed limit, until you look in your rearview mirror. Those flashing red lights are meant for you – the driver who has allegedly violated the traffic laws. As you wait for the police officer to issue the traffic ticket, you may wonder what options are open to you. There are two categories of traffic violations. Minor violations are those offenses not subject to a jail sentence. A speeding ticket is an example of a minor offense. 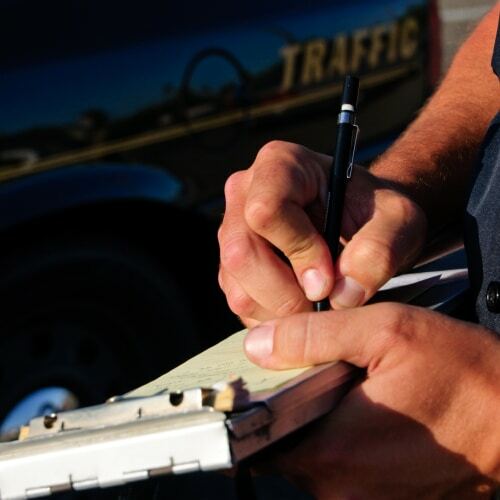 When you have been charged with minor violation, then you have two options: you may choose to either pay the fine that has been indicated on the ticket or contest the ticket by going to court. If you choose to pay the fine, then you are admitting you are guilty of the charge. Before paying the fine, you should be aware of the “point system” established by the Maryland Motor Vehicle Administration (MVA). This system can assess points on a driving record whenever a driver has been convicted of a violation. Within a two-year period, if you have accumulated five points on your license, the MVA will arrange a conference with you to discuss your driving record. If you have accumulated eight points on your license within that same two-year period, then your license may be suspended. You may wish to ask the police officer that issued the ticket how many points you will receive if you choose to pay the fine. A majority of motorists pay their fines precluding a trip to court. Be certain to sign the ticket as requested by the officer. Your signature simply shows that you have received the ticket; it is not an admission of guilt. If you choose to contest the ticket you may do so by going to court. The ticket will include the information that is necessary in scheduling a court date. If you fail to pay the fine and do not appear in court your driver’s license will automatically be suspended. A Driving While Suspended Conviction for failing to pay a ticket or appear in court is subject to a 60-day jail term and a $500 fine; so, be certain that you pay the ticket or appear in court to contest the violation. When you appear in court, you have a right to enter a plea of “not guilty” and the officer who issued the traffic ticket must be present to prove you intended to commit the traffic offense; you are guilty if the officer proves you committed the act. Your reason for speeding is not a defense, but may be used as mitigating circumstances that the judge will consider when the fine is imposed. The second category of traffic violations is known as ” major offenses” or incarcerable motor vehicle offenses. If you are convicted of a major offense, then you may be subject to a jail sentence. Driving While Intoxicated is one example of an incarcerable offense. If you are charged with an offense of that nature, then you must appear in court. Unlike minor offenses, you do not have a choice of paying a fine or going to court. If you have been charged with a major offense, you will receive a summons in the mail that will include the date, time and location of the trial. Be sure that you go to the correct courtroom at the time indicated on the summons. If the date you are to appear in court causes an unreasonable hardship (illness, hospitalization, etc. ); you may write to the court and ask for another date for good cause shown. However, make that request prior to the court date and be certain that it is granted before you fail to appear. This applies to either major or minor traffic violations. If you fail to appear on a major traffic violation, the judge may issue a warrant for your arrest. If you decide to hire a lawyer, you should do so before the date of trial. Everyone who has been charged with an offense subject to a jail term has the right to be represented by an attorney. An attorney can assist and prepare a defense; will know what evidence is legally admissible; what should be objected to during the trial and the different elements to a finding of guilty; assist in presenting mitigating circumstances if you enter a plea of guilty; and will know of alternative dispositions to jail or maximum penalties. If you are unemployed or indigent you may apply to the Office of the Public Defender. If you qualify for their services, an attorney will be appointed to represent you. Make the application to the Office of the Public Defender before the date of trial or you may find it necessary to make decisions without legal advice. Remember that the police officer is there to enforce traffic laws that are enacted for the safety of everyone on the road. Treat the officer with courtesy and you will receive the same treatment from the officer. If you disagree with the charge on the ticket, save it for the courtroom. Whenever conviction occurs on multiple charges based on offenses alleged to have been committed at the same time, or arising out of circumstances simultaneous in time and place, points shall be assessed against the person convicted only on the charge which has the highest point assessment and may not assess points to the remainder of the multiple charges. A forfeiture of collateral shall be considered as a conviction. The administration shall send a Warning Letter to each license charged with 3 points. He shall call in the licensee for a conference for 5 points. The license shall be suspended for 8 points. The license shall be Revoked for 12 points. Initial suspension shall not be less than 15 days and no more than 90 days. Points assessed shall be retained for two years from Violation Date. The Point System is an addition to any other provisions of the Maryland Vehicle Laws. The MVA may expunge your driving record if certain conditions apply. The Driver Record of each individual is public record.